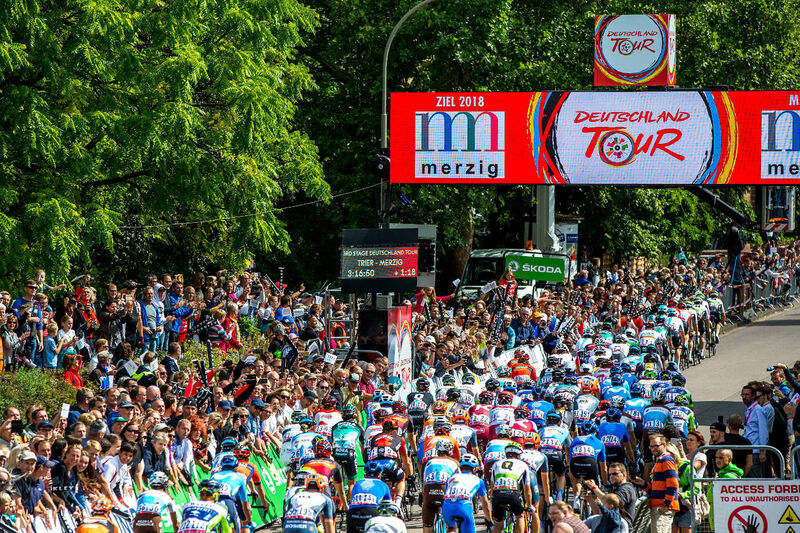 Stage 3 started in Trier and took the peloton over 177 kilometers to Merzig in Saarland. The puncheurs in the field could again look forward to a Classics profile with nearly 2900 climbing meters. After a flat start phase along the Mosel and the Saar, there were two laps of a circuit around the Saar, which will be hilly. In Merzig, the stage were decided on the closing circuit course, which gave a small group the chance on a steep ramp in the last 5 kilometers to get away from the sprinters. The beautiful Saarland area of Germany offered all the ingredients for an eventful battle between the big guns of the Deutschland Tour. Second yesterday behind Schachmann, Matej Mohoric enjoyed a sweet revenge claiming a fine victory. After the final hilly part of the day, the Slovenian proved to be the fastest of the reduced bunch, beating Nils Politt and Pieter Vanspeybrouck to the line. Junior World champion, U23 World champion and recently winner of the Binck Bank Tour, Mohoric conquers the overall lead and takes an option on final victory before the final day tomorrow in Stuttgart. After an extremely eventful stage 2 that saw the big guns of the race battle it out and Germany’s Maximilian Schachmann conquer victory and the overall leader’s red jersey, the day’s menu would be just as demanding if not more between Trier and Merzig. The 125 riders (two non-starters: Steff Cras of Katusha-Alpecin and August Jensen of Israel Cycling Academy) took off just after noon for a 177-km stage mainly in Saarland on a very hilly course including 5 climbs in the final 60kms. The pace was extremely fast straight from the start with team Quick Step leading the pack at first before Romain Bardet’s AG2R took command of the race as the course got hillier. Despite quite a few attempts, the first real breakaway occurred at km 29 when 8 men took off: Zabel (KAT), Hansen (LTS), Riesebeek (RNL), Shalunov (GAZ), Carpenter (RLY), Hugger (LKH), Hodapp (SVL) and Hollman (HRN). On the first climb of the day in Saarholzbach, Hugger failed to keep up with his companions and was dropped. 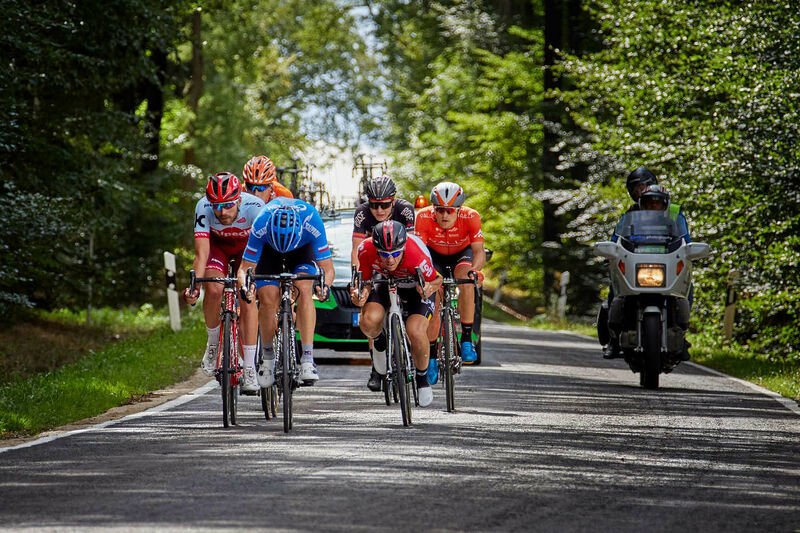 At the summit, Carpenter led the front group with a slim 35’’ advantage over a reduced pack without struggling sprinters Ackerman (BOH) and Hodeg (QST). After covering the distance of 47kms during the first hour of racing, things calmed down and the gap grew to 1’25’’ over the bunch at km 62 while Denz (ALM) tried his luck on a counter-attack before eventually stopping his vain effort. At the first intermediate sprint in Dillingen (km 74), won by Zabel ahead of Riesebeek and Carpenter, the gap reached 2’. At the feeding zone (km 82) the front group could enjoy a 3’20’’ lead and even 3’55 at km 100. At the top of the second hill (km 119,5), claimed again by Carpenter, the back now led by team Sky had moved closer, at 2’10’’. USA’s Robin Carpenter again made it first at the top of the third climb (km 131,5) virtually capturing the best climber’s jersey while the pack remained 1’20’’ adrift. At the second intermediate sprint (km140), once again claimed by Rick Zabel, there were still the same seven men in the lead with an advantage that had slighlty dropped (1’05’’). In the penultimate climb, Hodapp was the first to be dropped from the front and is caught. Led by Carpenter, the six front men reached the top (km 149,5) with a 55’’ advantage over the pack. It was then Hollman’s turn to be dropped while the pack moves closer and then Zabel with under 15kms to go. While the five remained together at the top of the final climb, Carpenter and Riesebeek gave it one final push. Eventually Carpenter crossed the line with a 10’’ lead but was finally caught in the final loop around Merzig. Getting closer to the bonus sprint situated at the top of a hill, Warren Barguil (FST) decided to attack, atking with him another former winner of a Tour de france stage, Pieter Weening (RNL). Barguil claimed the sprint and the race leaders could enjoy a 10’’ advantage with 7kms to go. The Franco-Dutch pair still had an 8’’ lead with 3kms to go but were eventually caught within the final kilometre. A reduced pack therefore showed up on the finish straight for what was to be a bunched sprint. Beaten by Schachmann on the previous day, Matej Mohoric (TBM) this time showed he was the strongest. The Slovenian narrowly beat Nils Politt (KAT) and Pieter Vanspeybrouck (WGG) to the line. 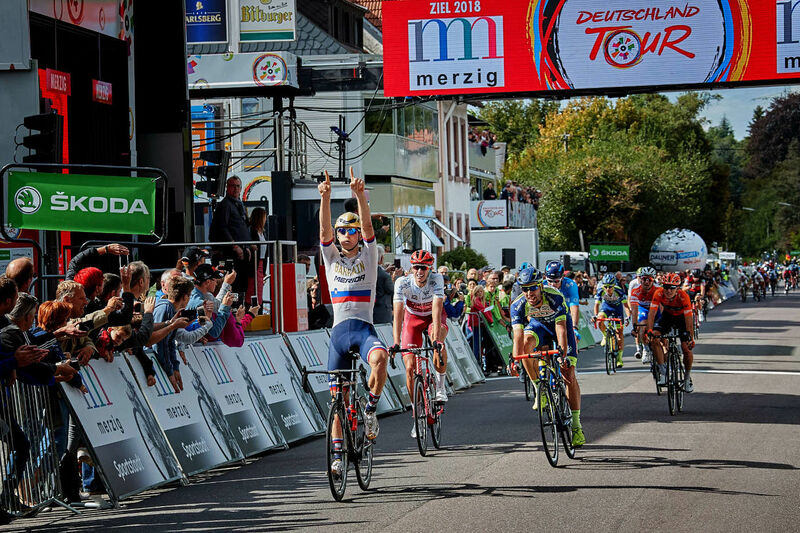 The 23-year-old captures the overall leadership with a 6’’ advantage on Schachammn and 10’’ on Politt, and will be wearing the red jersey on the final stage to Stuttgart tomorrow with the clear ambition to conquer this Deutschland Tour. The former junior (in 2012) and U23 World champion (in 2013) also leads the points classification and best young rider’s standings. The third stage of the Deutschland Tour runs from Trier to Merzig. The start is at the impressive Porta Nigra. 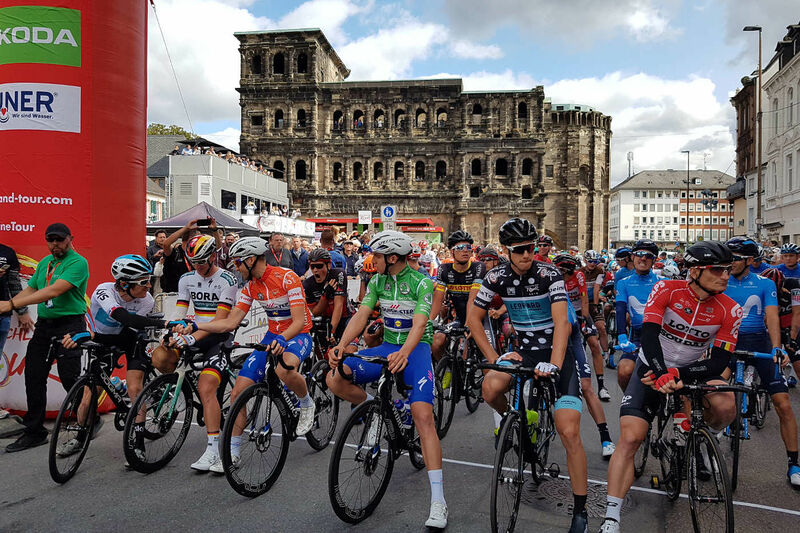 A neutralised section of 4.5 kilometers through downtown Trier gives the fans a close-up view of the riders. Passing the tourist attractions like the Marktbrunnen and the Trier Dom, the course runs along the Kaiserstraße to the Mosel. On the B51 at the Staustufe, the peloton starts in the weekend. The first 35 kilometers are totally flat, first along the Mosel and then the Saar. The riders shouldn’t let this first hour of racing fool them, because it will be a challenging day. 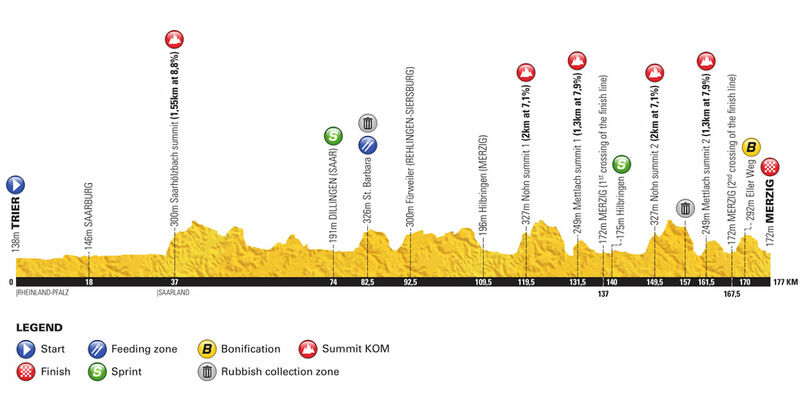 A 1.5 km climb in Saarhölzbach is the opener for the day’s saw-edge profile. From this ranked climb, it goes further with a loop over Losheim to Dillingen, where the first of two intermediate sprints will be held after 74 kilometers. After crossing the Saar, the climb to the Saargau in St. Barbara starts and after a short descent, it goes up again towards Hemmersdorf. The course runs along the French border to Hilbringen – the start of the circuit of eh Saarschleife, which will be ridden twice. With the challenging climbs to Nohn and Mettlach, there are two ranked climbs within 12 kilometers. From the the field reaches Merzig and crosses the finish line for the first time. The sprint in Hilbringen opens the second lap of the Saarschleife, again with ranked climbs in Nohn and Mettlach. After nearly 30 km, the finish line in Merzig will once again be crossed. 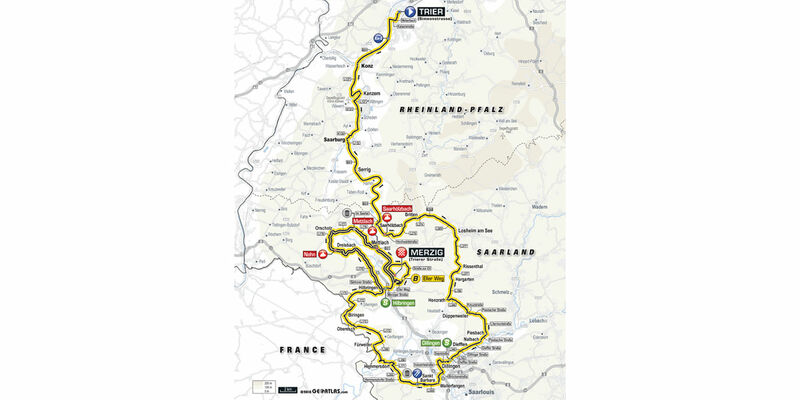 But first the field has to take on a short 9.5 kilometer circuit to the Merziger Kreuzberg. On Eller Weg, 7 kilometers before the finish, aggressive riders can go for an attack and pick up bonus seconds. From there it is only a descent to the finish line on the Trierer Straße in Merzig.